It has been fairly amazing to watch this Yahoo “sunsetting” news over the past 48 hours. It seemed to go from a bad leak, to huge backlash, to PR disaster, to confusion, to worse PR disaster. Now Yahoo, by way of Delicious (the most prominent service being “sunset”), has responded by lashing out at all the press for the coverage of the fiasco. Danny Sullivan just did a great job of ripping them a new one for this nonsense misdirection. But the issue actually goes much deeper. Yahoo may not be killing Delicious, but they have killed something else: consumer confidence in them. The entire time I was reading the back and forth of this fiasco, I had one thought on my mind: I need to get my pictures out of Flickr, pronto. No, Flickr wasn’t on the list of companies being “sunset”, but how do I know that in a year it won’t be? Hell, maybe even 6 months from now? I don’t. In fact, I’d say it’s 50/50 that something similar happens with that service. Sure, Delicious has been largely stagnant over the past few years (which, of course, is Yahoo’s fault), but it has long been one of the mainstays of the so-called “Web 2.0” movement. In fact, the sale of Delicious to Yahoo was one of the first stories that TechCrunch broke back in 2005. There are a ton of people that have a ton of data in it. It’s still a valuable tool to those people. It has millions of users. Yahoo just gave them all the middle finger. Mathew Ingram argues that the moves makes sense from a business perspective. Maybe. But the key ingredient of Yahoo’s business is people using their services. If they’ve showing that they can just kill off such a big one on a whim, I’m just not sure how they can convince us that all of them aren’t at risk. Yahoo says that Delicious isn’t “a strategic fit” for the company anymore. How is Flickr? I know the CEO Carol Bartz has a hard time explaining what Yahoo is, but of the dozen answers she has given, one hasn’t been “photo-sharing service”. It’s true that plenty of other large companies kill off products all the time. Google, for example, “sunset” a number of services like Dodgeball and Jaiku in early 2009. But that was a different time. The entire U.S. economy was collapsing. Everyone was making cuts everywhere. And none of those services were the size of Delicious. Yahoo’s plan now is to try to find a buyer for Delicious. That’s great, but it might not be so easy. Even though they just likely drove down the price with this fiasco, they’re still going to want a pretty penny for the company. It has been a part of Yahoo for so long that there’s likely a lot of proprietary code behind it, and they’re not going to part with that for nothing. Even before all of this info got leaked, we had heard there was interest from other Bay Area companies taking Delicious off of Yahoo’s hands. The hold-up was and likely still will be the price. I’m sure they will be able to find a buyer, but it’s not going to be as easy as they’re making it seem. And again, that’s very troubling. What if it’s a death-by-default situation? 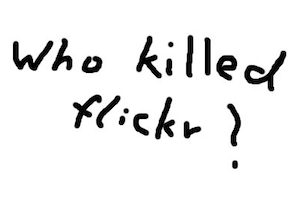 And Flickr is a thousand times more troubling. That service is so large that the only ones who could likely buy them off of Yahoo are one of the big boys. That means Google, Microsoft, Apple, Amazon, etc. And again, there’s likely a lot of code in there that Yahoo may not want companies that they still see as competitors in some ways buying. The whole situation is just sad. Yahoo has become a shadow of what it once was. Even with massive layoff after massive layoff, they still have tons of talented people working there. But those people can’t do anything about big picture product direction decisions coming from the top as Yahoo tries to morph into some kind of something that will make shareholders happy. And that’s the thing. Yahoo is all about the shareholders now. It’s all about the bottom-line. That’s all that matters. It’s not about the users. It’s not about building or maintaining great products. It’s about finding the ones that make the money and slicing the rest. People often express their growing concerns about putting data into Google for privacy reasons. But I now have a problem putting data into Yahoo out of the concern that it could just disappear one day. That’s really terrifying.